Front side LENGTH from shoulder: 74cm / 29in. Sleeve length from shoulder: 59cm / 23in. Back side Length: 77cm / 30in. Fab size large baseball style jacket from burton, the jacket is in good condition. Front side LENGTH from shoulder: 74cm / 29in. Back side Length: 79cm / 31in. Sleeve length from shoulder: 59cm / 23in. Burton lovely designer Coat. • Colour - green. • Very Good, clean condition. BURTON Jacket. Length (from bottom of collar to bottom hem): 28" or 71 cm. Two front pockets. Breathing armpits. Mens Burton 3/4 Length Trench Coat Mac Size Medium. Condition is Used. Dispatched with eBay delivery – Shutl 2-3 days. Collar is a bit worn.easy to rectify. Ideal for leisure or cafe racer cool. Men's wool coat, heavy/winter. 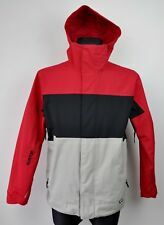 Size small, from Burton. Chest is approx 53cm across the front when fastened. Burton Snowboards Woodford Vest Ash Size Medium RRP £115 - Clearance Bargain! Built to last, its burly cotton canvas shell fabric has a classic look that hides light yet warm insulation and a soft, breathable taffeta lining. A full array of snap and zipper closure pockets on the chest and lower body provide storage options by the fistful. It's hard to understand just what you're missing until you've experienced the Burton Evergreen Lightweight Insulator Jacket. The water-repellent DRYRIDE DWR coating sheds stormy weather while the adjustable hem and elastic cuffs help block out the wind. Smart rich wool coat from Burton. -Stand collar. -Central vent on the back. -Zip and hidden button fastening. Burton leather jacket in good condition. Shell is genuine leather, lining is 50% nylon & 50% acetate, filler is 100% polyester. BOG HEATHER. A breathable and plush tech taffeta lining adds strategic warmth and breathability for improved comfort. Its THERMOLITE Insulation is 40% recycled, and the entire jacket is bluesign approved to lighten the impact on both people and the planet. Armpit to Cuff 21” 54cm. These are woven especially for us and available in Herringbone, Windowpane and plain weaves in a traditional heavy (470-500gms) weight. Jeans & Denim. Coats & Jackets. Waistcoats & Gilets. The item you receive will be a unique piece of history. As one of the smartest jackets in snowboarding, the Burton 2L GORE-TEX Spruce Jacket's PrimaLoft insulation is like a built-in vest, focusing warmth around your core while leaving your arms light and free to move about.